WASHINGTON — Many Democrats took to social media to voice their thoughts after a racist yearbook photo from Virginia Gov. Ralph Northam's 1984 Eastern Virginia Medical School yearbook surfaced Friday. The photo shows several pictures on Northam's page, including one of a man in blackface and the another in a Ku Klux Klan hood and robe. It's unclear if Northam is either of the men, but he took to social media Friday night to apologize for behavior in his past. Virginia Senate Democrats said they are standing by their previous statements calling for Northam to resign. They said Northam is "no longer the best person to lead" the state "through the healing process." D.C. Mayor Muriel Bowser also released a statement calling on Northam to resign. Virginia Attorney General Mark R. Herring issued a statement saying he believes it is "no longer possible for Governor Northam to lead [the] Commonwealth." Virginia U.S. 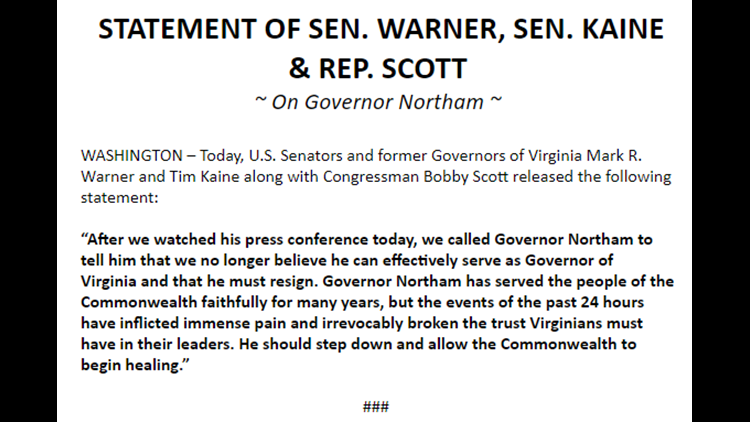 Senator Mark Warner, Senator Tim Kaine, and Congressman Bobby Scott released a joint statement on Saturday calling for Gov. Northam to resign. All say the "events of the past 24 hours have inflicted immense pain and irrevocably broken the trust Virginians must have in their leaders." In a statement to WUSA9 Virginia Delegate Mark L Keam said, "I've already expressed my view, and my legislative colleagues agree, that the governor needs to step aside immediately." Keam, who represents the 35th House District, also said his main priority now is "to focus on a very heavy docket of work that awaits when we return to Richmond. Regardless of who is Virginia's governor Monday morning, the people's legislature will convene to work on hundreds of bills, including major tax conformity, which must pass by Wednesday." Rep. Jennifer Wexton called for Northam to resign stating, "This is a difficult time for our Commonwealth, but I know we can move forward and start healing under the leadership of @LGJustinFairfax." Tom Perez, chairman of the Democratic National Committee also issued a statement calling for Northam's resignation. Former Gov. Terry McAuliffe, Ben Jealous and Senator Kamala Harris have also called for Northam resignation. Although many are calling Northam's resignation, there are others who have taken a milder approach. Wilder tweeted an update at 7:25 p.m. Saturday clearing up his previous statement by saying "It is difficult for anyone who watched the press conference today to conclude that he has any other choice ... but to resign." Virginia's Lt. Gov. Justin Fairfax hasn't directly called for Northam's resignation. Fairfax said he is "shocked and saddened by the images in the governor's yearbook." Fairfax said he remains "committed to serving and helping to heal the Commonwealth moving forward. Now more than ever, we must make decisions in the best interests of the people of the Commonwealth of Virginia." Northam was elected as Virginia's 73rd governor in 2018. If he resigns, Fairfax will become the second African American governor of Virginia. Eastern Virginia Medical School's president Richard V. Homan, issued a statement regarding the photo on Saturday calling it "shockingly abhorrent and absolutely antithetical to the principles, morals and values" of the school.